Florence McNair and Gene Kato, volunteer musicians from Noda, Chiba prefecture--assisted by their friends and volunteer coworkers--travel to various evacuation sites in Iwate, Miyagi, and Fukushima prefectures, to bring entertainment and encouragement to those affected by this terrible tragedy. "Even though we cannot imagine what they must be going through, our prayers and our earnest efforts are with our friends who have been affected by this tragedy. As we have come to know them throughout our trips, and have made personal friends in each of these cities, we feel more strongly that it is our life's calling to do our best to bring whatever hope and encouragement we can with our music." Ainote volunteers (currently accepting anyone who wants to sign up!!) 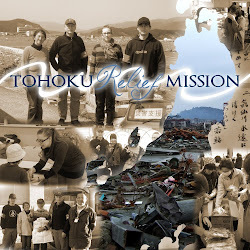 working together with friends and neighbors, are making trips to the tsunami-affected areas, to bring all kinds of food, clothes, and everyday-items.